Anniversaries are a special occasion in anybody’s life. Well it only comes once every year and it is a day that is all about you. There are keys to a great day. Here are some ideas on how to make it that special day you don’t know how you will top on the next year. Edinburg is the place to be during a weekend anniversary. Here are 4 hotels that will give you the time and place you will enjoy every single second the whole time you are there. The work commitment of the staff and the décor of the hotel is a thing to long for. The place provides the feeling of a home and also that of a wonderful romantic environment. His place provides a wonderful time for a couple during an anniversary weekend. This is one weekend where everyone wants to be pampered and indeed this place does pamper you. Every aspect of this place is wonderful and romantic providing the perfect feeling a couple would want in their anniversary. Apart from the perfect hotel, a wedding anniversary also requires other in-puts to make it a success. These are such as a romantic dinner. It includes choosing of a hotel with the right ambiance giving you what you want. This is such as The George Hotel which according to many did not fail at all. It has been named the perfect hotel for a perfect romantic dinner. It provides a view of the castle and has a laid back setting. 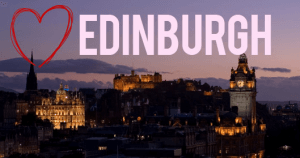 Other activities include, a film tour around Edinburgh where you get to learn the different places and the rich, exciting cinematic past of the place. This is a 2 hour tour taking place over the weekend from 7 pm Friday through Sunday. It provides wonderful hours to tour the place.